AUGUSTA, GA. – As a male Kindergarten teacher, Justin Flanders is a bit of an outlier, but he doesn’t seem to mind. When asked what it is like being the lone male in a profession typically dominated by women, he smiles and leans in for a joke. “Of course I have to do all the heavy lifting,” he laughs. Justin’s joke aside, one thing is clear: he has done a lot of heavy lifting, both academically and professionally, since earning a Bachelor’s degree in Early Childhood Education at Augusta State University four years ago. 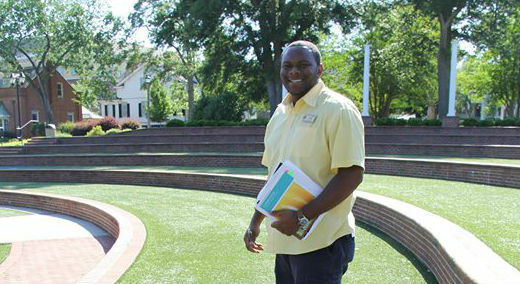 Directly after completing that degree, he started teaching at Tobacco Road Elementary School in Augusta, and one year later found himself a student, again, but this time at Georgia Regents University, to earn his Master of Education in Curriculum and Instruction. As he rounds out his fourth year of teaching, he has returned to GRU for an Education Specialist in Curriculum and Instruction. Justin has always wanted to be a teacher, but he didn’t always know what he wanted to teach. After taking course after course and not finding his niche, one of Justin’s instructors, Dr. Jackson, suggested he try early childhood education. The idea of teaching a range of subjects appealed to Justin, and when his first teaching assignment was a 5th grade class, he didn’t have to go far for inspiration. Currently, Justin is enjoying his tenure as a Kindergarten teacher, and has thrown himself into the task of mentoring his young students and teaching them basic skills. He is working now to become a stronger reading teacher and said research has helped him prepare his students to be academically competitive outside of Augusta. “My graduate studies have made me a better teacher because it has taught me not to just teach local, but also globally,” he explained. As Justin progresses as an early education teacher, he’s found that with each degree earned at GRU, a new door has opened, not only for him, but for his students, too. He gives credit to his graduate education when explaining how he came to learn the science behind common teaching practices. Summer vacation has offered a small reprieve for Justin, who in addition to working full-time and earning his degree, also works at the Double Tree. He plans to use the time to study and prepare for a new classroom full of students. Like many students, making time for everything is his biggest challenge, but he said he’s never regretted pursuing his degrees at GRU. Justin advises his fellow students to keep working towards their degrees, stating they should “stay on top of research,” and always be willing to go back to school to learn new techniques. As for Justin, he doesn’t plan to slow down anytime soon. “In the future, I would hope to be Dr. Flanders,” he said.